Once known as Rangoon, Yangon is no longer the capital of Myanmar. The military government officially relocated to Naypyidaw in 2006. However, it is by far the country's largest city and its economic hub. With over seven million people living in the greater Yangon area, downtown Yangon is hectic and colorful. This is a working city where tourism is still relatively new. Wander away from the main tourist hotels and sites and you may feel as if you are the only foreigner in this exotic city. 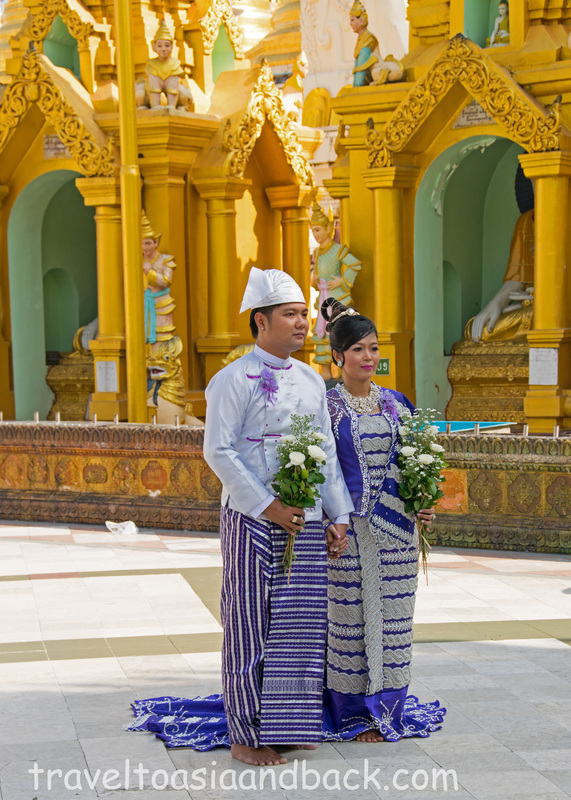 Deeply connected to its colonial past, Yangon is a melting pot of religions, ethnicities and culture. Mosques, temples and churches of various denominations sit side by side on narrow streets originally designed and constructed by British engineers. Neighborhoods named Chinatown and Little India are only a short walk from enormous gilded pagodas built by the Theravada Buddhist Burmese people. The city’s architecture is an eclectic mixture of colonial-era and modern Chinese construction. In some cases, the Central Railway Station and City Hall for example, east meets west in unique designs that blend the two completely different styles together. Perhaps the most endearing thing about Yangon is the old colonial buildings, relics from the era of British rule. Much of the city, particularly the area along Pansodan Street north of Strand Road is composed of these magnificent old buildings. A walking tour of Yangon is a must do and a great starting point is the office of the Yangon Heritage Trust at 22-24 Pansodan Street. The Trust has amassed a wonderful collection of photographs of Yangon taken at the turn of the century, and can provide visitors with a wealth of information about the city. They also conduct fantastic walking tours which focus on the history and preservation of the city’s heritage sites. Many of Yangon’s oldest buildings are in an advanced state of decay and in serious need of refurbishment. Oddly enough, the cities decay adds to its charm. Torrential monsoon rains have left buildings stained and discolored but also create miniature forests on apartment balconies. 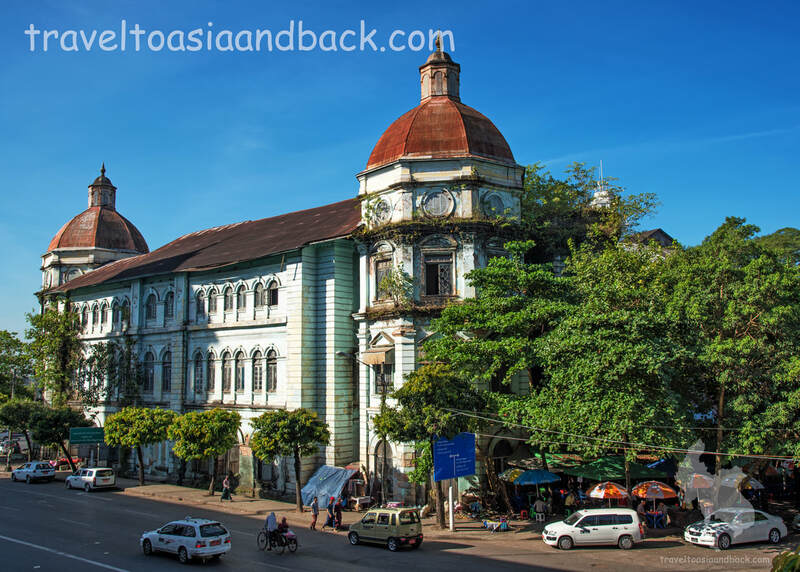 Downtown Yangon is a fascinating area to explore but be forewarned that much of the area to the north and east of Sule Pagoda is dirty and rundown. Like every city, Yangon has its problems and trash collection appears to be a big one. Much of the inner city's roads and sidewalks are in desperate need of repair. Please pay attention to where you place your feet as falling over bits of broken pavement is a real possibility. Putting all this aside, the people are friendly and welcoming. The city is well known for its beautiful Buddhist temples, locally known as pagodas, which include Botatuang, Sule and Swedagon. The gilded Sule Pagoda is a prominent feature of downtown Yangon, in part because Lt. Alexander Fraser, the engineer who laid out the city’s roads, made it the center-point of colonial Rangoon. 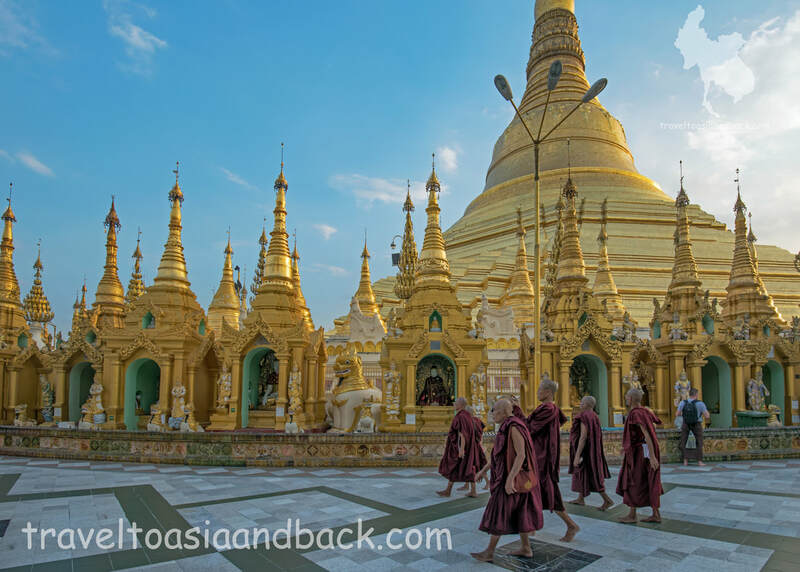 However, there is no question that Swedagon Pagoda is the largest and most impressive of the three and is an important pilgrimage site for Buddhists. Many would argue that Swedagon is perhaps one of the most spectacular temples in Southeast Asia. It is a “must-see” site for everyone who visits Yangon. Legend has it that 2500 years ago strands of the Buddha’s hair and other relics were enshrined in a small stupa at this holy site. Swedagon’s main stupa has been rebuilt and enlarged many times since it got its first major restoration in the fourteenth century. The current height of the stupa is 99 meters which includes its jewel-encrusted gold crown. Across the road from Swedagon's south entrance is the Maha Wizaya Paya. Built in 1980, it features a domed ceiling with very unique art work and a number of beautiful Buddha images (statues) encased in glass. This pagoda gets far fewer visitors than the others, making it a relaxing stop after seeing busy Swedagon. The area around Swedagon Pagoda is quite lush and lovely with tree-lined streets and carefully manicured flower gardens. The area is ringed with many beautiful parks and green spaces. To the north of Swedagon you will find Theingottara Park and the Martyr’s Mausoleum. To the east is Kandawgi Lake with the Yangon Zoological Gardens located on the lake’s south side. Taw Mingalar Garden lies on the western side of Swedagon’s south entrance. At the western entrance is the People’s Park which is directly behind the Myanmar Cultural Valley. The Cultural Valley is essentially a shopping mall which happens to have a couple of good restaurants. There’s little doubt that an entire day could be spent touring this part of the city. Half a mile south of Swedagon but a bit off the regular tourist path is the tomb of Bahadur Shah Zafar, the last Mughal Emperor of India. Considered by many to be a Sufi Saint, the renowned poet was exiled by the British to Rangoon in 1858 after the Indian rebellion of 1857. He died of natural causes in 1862 at the age of 87 and was buried by British authorities the same day. At that time, the official in charge would not divulge the exact location of the tomb. It would remain “lost” until 1991 when construction workers happened upon it. Generally, the most economical international flights into Myanmar arrive and depart from Yangon International Airport (RGN). Located 15 kilometers from the city center, many travelers will choose to spend at least a few nights in the capital city before moving on to other parts of the country. Spending at least one night in Yangon before departing on an international flight is advisable as well as for internal travel in Myanmar, particularly by bus and train, which can be slow and delays are not uncommon. ​From Yangon International Airport many of Myanmar’s most popular travelers’ destinations can be reached by domestic airlines. Asian Wings, Air Bagan and Air KBZ are a few of the country’s reputable domestic carriers that allow online booking. We recommend booking flights directly with these airlines and avoid using third parties like travel agencies. Although traveling by plane is the fastest and easiest way to travel in Myanmar it is rather expensive when compared to other Asian nations. Many backpackers and budget travelers choose to explore the country by bus, train or a combination of both. Yangon is the country’s main train and bus travel hub and is a logical place to start a journey through the country. Located in downtown Yangon, the Central Railway Station is the terminus of five different railway lines. 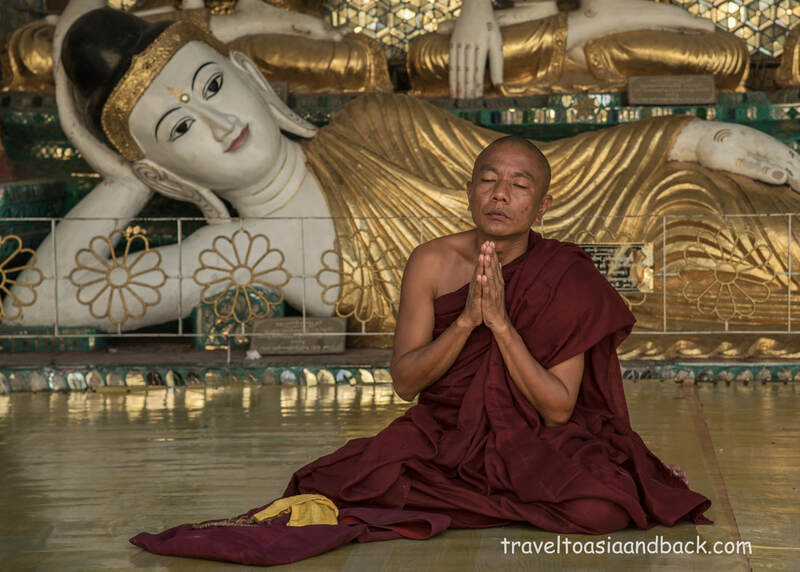 From Yangon train travel is possible to a number of popular and some off-the-beaten-path travelers’ destinations such as Bagan (Nyaung Oo), Mandalay, Heho, Mawlamyaing, Pyay, Kalaw and Shwenyaung (for Inle Lake). Train tickets can be easily purchased at the station. Platform Number Seven is the departure point of Yangon’s Circular Railway. Originally constructed in 1954 by the British during the colonial period, the 46 kilometers of meter gauge rail make a loop around Yangon’s suburbs. Passing through 39 stations, this is Yangon’s antique version of a metro system. Since it is incredibly inexpensive, a ticket is 200 MMK or $.20 USD, it is the preferred transportation method of Yangon’s poorest residents. Although some visitors make use of the circular railway to visit sights outside of downtown, the railway line has become a tourist attraction in its own right. Riding around the city elbow to elbow with the locals is a great way to get a glimpse of the daily life of Yangon’s citizens. To complete the entire journey takes roughly three hours. Yangon has two main bus stations that will be of interest to budget travelers and backpackers planning a tour of Myanmar. The Aung Mingalar Bus Terminal, also known as the Highway Bus Station, is located 20 kilometers north of downtown on Paya Road. This station is the departure point for buses to Bagan, Bago, Hpa-An, Lashio, Kalaw, Mandalay, Mawlamyine, Pyay and Taunggyi. The station is most easily reached by taxi; the forty-minute trip costs approximately 10,000 – 14,000 MMK or $8-10 USD. Travelers headed to Pathein, Chaungtha Beach, Ngwe Saung Beach and other parts of the Irrawaddy Delta region will need to take buses from the Hlaing Thar Yar Bus Terminal which is also known as Dagon Ayer Bus Station. This station is located 15 kilometers from the city on the west side of the Hlaing River. This station is also most easily reached by taxi, the thirty to forty-minute trip costs approximately 10,000 – 14,000 MMK or $8-10 USD.